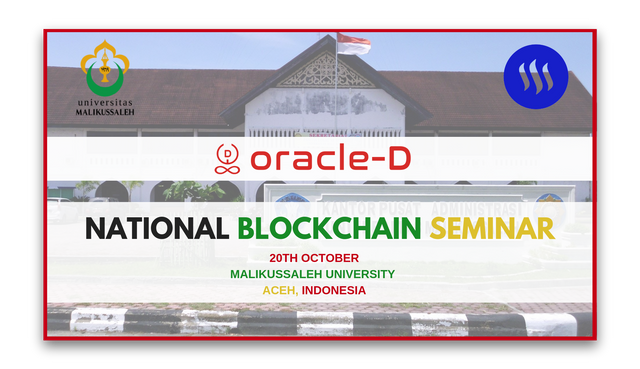 Oracle-D Is Giving National Blockchain Seminar At Malikussaleh University, Aceh in Indonesia! We will start our next journey in Indonesia from 18th Oct. in Aceh Province. It has beautiful beaches and a huge potential for Blockchain Technology. Since the day of arrival, we have a plan of back to back meetings with some of the most influential people of the country and we will connect with locals too. We have got a golden chance to give a seminar in the famous Malikussaleh University aka UNIMAL. Thanks to continuous efforts from @Mariska.Lubis and @Ayijufridar who together made this possible. Special mention to Faculty of Economics and Business Malikusalleh University (FEB Unimal) Dean, Mr. Wahyuddin Albra for agreeing to make this event a reality. We are expecting university students, bankers, bloggers, lecturers, entrepreneurs, and Steemians to attend this event. Timings: 09:30 AM – 12:00 PM, West Indonesia Time. It is our immense pleasure to be a part of this event. We will try our best to spread our knowledge about Blockchain Technology and STEEM to help people of Indonesia. is a new STEEM blockchain business venture bringing new investment into the ecosystem. Founded by @starkerz and @anarcotech, we previously were co-founders of the #promo-steem and @steem-ambassador projects, and we developed the CAMPUS curation system, which is a fully decentralised system for distributing rewards. We remain apolitical, and our number one goal is to raise the price and utility of the STEEM blockchain, improve culture and education about the blockchain, and create opportunities which support exceptional quality content creators through collaboration with investors and clients. In other words, to add as much value to the blockchain every day as we can. Go to our campaign's link given above and donate to us. 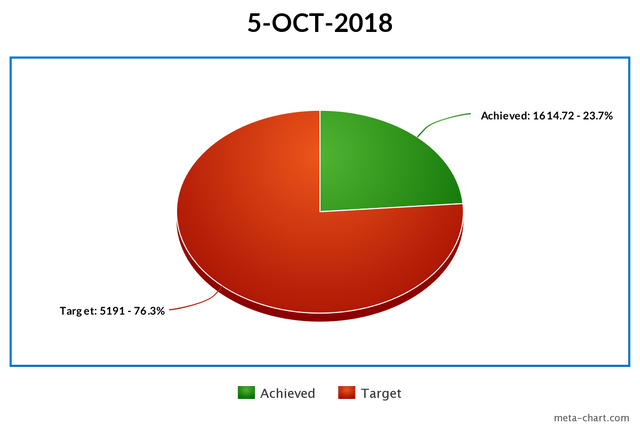 The funding we get will be used only to cover the expenses of the events we will attend to attract more investors. Upvote & Resteem this blog and spread the word about Oracle-D and our campaign. Support our writers and their content which will ultimately empower quality on the STEEM Blockchain. Join our curation trail in SteemAuto to maximize your curation rewards. Any kind of contribution is much appreciated and thank you for being a part of this Journey! Also, please do not hesitate to connect with us for any kind of collaborations that can help the STEEM Community grow. This is awesome to hear!! would you like to discuss separately? It's look interesting, that place ia very near ini my address. I happy about this discuss, because I like it and I was following the promo steem and Steemit meet up agenda. would really have loved to listen to your lectures @oracle-d but it's quite unfortunate that I don't reside there. Sorry to hear you cant be there, however, I am sure that we have some representatives near to you. Where are you? Fundition is a next-generation, decentralized, peer-to-peer crowdfunding and collaboration platform, built on the Steem blockchain. #upfundition and #fundition tags on Steem represent the projects that are started on https://fundition.io. Are You Prepared to Make the World a Better Place too? Thank you @dreamzar! great to hear of your interest! We look forward to what the future brings! I have thought of ways and tried to take the time to be able to attend to this. Hopefully the work will not accumulate when approaching. Maybe we will sit in the same room. Success !! !